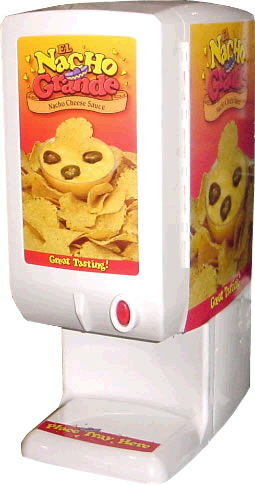 Cheese dispenser is 10" W x 17" D x 28" H; 18 lbs. Requires bagged cheese. Machine maintains air tight control over cheese sauce and extracts more out of every bag. Bag must have cheese tube attached in order to use. When purchasing cheese supplied by APA, tube provided. When purchasing cheese elsewhere, tube is customer's responsibility. Maintains (adjustable) 140-160 degree cheese temperature. Cheese should be pre-heated in top of machine for 3 to 4 hours to be ready to serve. Features space to pre-heat second bag inside. Pre-heated cheese makes for quicker serving time. .NACHO Chip TRAY 6" x 8"
* Please call us for any questions on our cheese dispenser rentals in Ft. Wayne IN, Warsaw, Syracuse, Auburn, South Bend, Indianapolis IN.